The previous A Hero A Fake release, "Volatile" from a little over a year ago, showcased a band with immense potential waiting to be unleashed the moment these dudes would grew as people and musicians, but also one that could easily take a wrong turn and return back to obscurity on their next album. Back then, their strategy for writing technical metal was to copy everything Between The Buried And Me were standing for on pre- and on "Alaska", inject it with a billion breakdowns and hope for the best, which actually turned out alright despite its many shortcomings especially with regard to identity and breakdowns galore. I'm happy to report that A Hero A Fake have made all the right decisions before writing and recording their new album "Let Oceans Lie". The band has always been immensely technical, with blinding leads racing left and right, leaving no breathing room for the listener as he is left to experience the very definition of technical metal first hand. On the new album, the dueling guitars are even more technical and melodic than before, now also integrating the odd jazz interlude in places (think Ephel Duath style), which is of course great, but more importantly, the breakdowns that plagued the majority of "Volatile" have been shoved aside in favour of a more flowing, progressive musical direction. 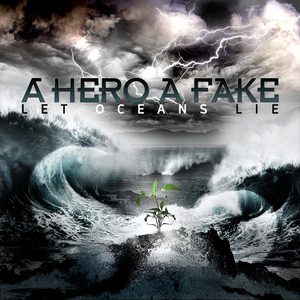 Instead of sounding like a b rate version of Between The Buried And Me, A Hero A Fake now sound like A Hero A Fake and no-one else, as the band has been able to craft a solid identity through incredibly varied songs, while still keeping the red thread flowing throughout the album. Much of this can be accredited to the band's vocalist, who has improved heaps and bounds, now sporting a much thicker, more decipherable and technically superior melodic growl than before. The whiny clean vocals have improved as well, and are now used more often, but never to the extent that every chorus would be a formulaic one with clean vocals contrasting some growls. Instead, they are used randomly during verses and bridges, in fitting timings that make sense. The exception is the horrid ballad "Images" which should've been left out. There's really no way around continuing to praise the band's two guitarists, as the technical passages are in places so jaw-dropping they almost leave Between The Buried And Me in their shadow. The decision to drop most breakdowns in favour of more challenging and interesting song structures instead helps to create that melodic flow throughout the album which makes "Let Oceans Lie" so good. If you're into heavy, screamed, and growled progressive metalcore that leaves your inner guitar student failing miserably in attempting to learn these songs, don't miss out on the record. At this pace, the next A Hero A Fake album will be among the best albums in its year of release.